The oil market is experiencing some sell-off this morning driven by additional trade war tension. Crude saw some volatility yesterday before closing the day mostly flat. This morning, crude is marching lower despite a constructive API report, giving up 84 cents to trade at $73.27. Fuel prices are also plummeting, reversing yesterday’s mild gains. Diesel has lost 2.5 cents and is currently trading at $2.1967. Gasoline has fallen by 2.3 cents to trade at 2.1367 this morning. Yesterday, the Trump administration threatened to impose round two of tariffs on China adding a 10% tariff on an additional 200 billion in Chinese goods. China noted they will respond, however, details of how they intend to respond have yet to be released. The market continues to view tariffs as negative for economic growth, putting downward pressure on prices. 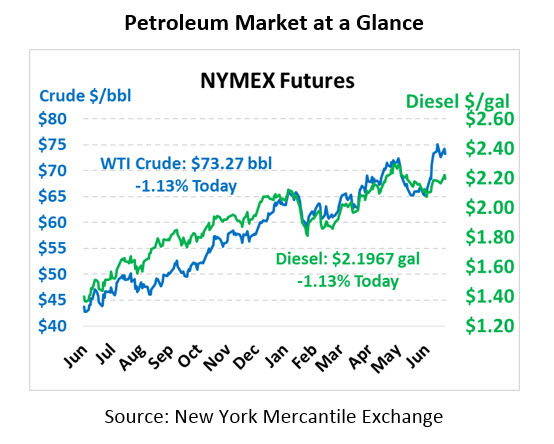 The API reported large draws in crude inventories this week and mixed product results. Crude drew by 6.8 MMbbls, exceeding market expectations. Gasoline drew by 1.6 MMbbls while diesel built by 2.0, brining products to a net 0.4 MMbbls build. The EIA published their monthly Short-Term Energy Outlook report this week. Average retail gasoline prices are expected to hit $2.83 in September and fall to $2.70 in December before rising to $2.77 in 2019. Diesel retail prices are set to average $3.14 by the end of 2018 and $3.07 for 2019. Starting at $77 per barrel in May and $74 in June, Brent crude oil are expected to fall to an average of $73/b this year and $69/b in 2019. The EIA expects WTI crude oil prices to average $6/b lower than Brent prices this year and $7/b next year. U.S. crude oil production is expected to average 10.9 MMbpd in 2018, surpassing the previous all-time record of 9.6 MMpbd, and rise to a whopping 11.8 MMbpd in 2019.